Vancouver office workers rate the Canon copier easiest to use overall compared to the Xerox, Konica Minolta, and Ricoh copiers. 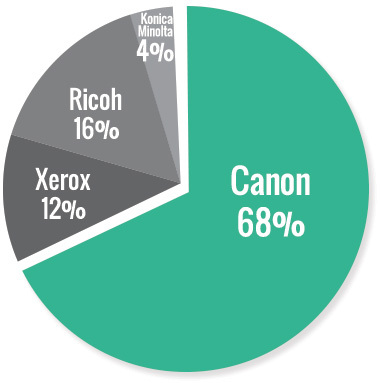 Vancouver office workers prefer the Canon copier most overall compared to the Xerox, Konica Minolta, and Ricoh copiers. Vancouver office workers rank the Canon copier easier to use when compared to the Xerox copier. Vancouver office workers rank the Canon copier easier to use when compared to the Konica Minolta copier. Vancouver office workers rank the Canon copier easier to use when compared to the Ricoh copier.